Deeply rooted in marine history spanning over 400 years and with the Cristobal Colon wreck recently honored by Scuba Diving magazine readers as the No. 1 Wreck destination in the Caribbean and Atlantic, Bermuda is undeniably a mecca for discovering the captivating world under the sea. But as they say, there are other fish in the sea. Shipwrecks offer a treasure trove full of history and silent grandeur that you just cannot find above water. Whether propelled by morbid curiousity or curiosity to explore the world's last frontier, divers have been drawn to these siren song of these wrecks. For your consideration, we open up Davy Jones' Locker for a tour through the ten most dramatic. 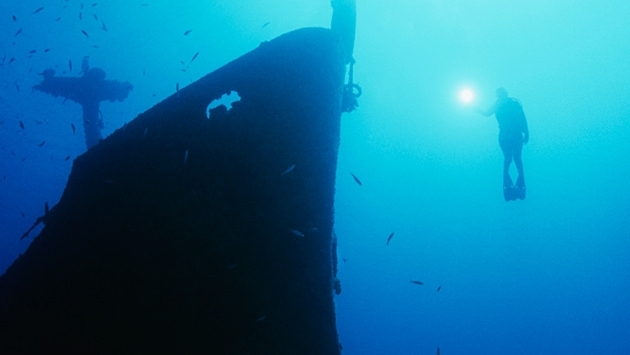 A trip to the Red Sea would not be complete without a dive into its historic wrecks. The most legendary of them all, the SS Thistlegorm offers a swim of a lifetime as history, mystique and beauty encompass the entire 400 feet of this sunken treasure. Laid to rest by German bomber planes, this British armed Merchant Navy Ship completed three successful voyages to the U.S., Argentina and the West Indies before meeting its fate while anchored in the Sha’ab Ali in the Gulf of Chez in 1941. Divers of this historic underwater museum can get up close to the SS Thistlegorm’s bow and propeller as well as its military cargo, trucks, guns, and motorbikes which never made it to shore. However, they are expected to possess a certification from a reputable scuba school as nearby currents are quite strong. Getting stuck in the path of a hurricane proved fatal for Captain Woolley and his hundreds of passengers. The howling winds and massive waves pushed the Royal Mail Steam ship onto the jagged rocks of Black Rock Point, which pierced through the ship’s side, causing water to flow to the boiler. With a loud explosion, the ship was split in half and now resides in two areas off of BVI’s Salt Island. As one of the world’s most impressive underwater experiences, a dive to this eerie site is met with sights of schools of tropical fish, colorful coral, the bow and prow, silverware, the propeller, as well as the spoon Captain Woolley used as he nervously stirred his tea before he was thrown overboard by a ferocious wave. Out of the ashes of Mount Agung produced one of Bali’s most spectacular shipwrecks. The ghostly figure of the USAT Liberty, a cargo ship of the U.S. Army, rests on a sand slope of up to 100 feet submerged in water. It served a valuable time in World War II before it landed in the hands of the Japanese, who completely wrecked it from top to bottom. On its way to Singaraja to be repaired, water began to creep into the cracks of the ship, which led to its anchoring in Bali. However, the eruption of Mount Agung moved USAT Liberty off the beach, which ultimately landed the ship in deep water. You will not need to take a dive to see this outlandish site. Set on a 75-mile sandy beach, the chilling features of this skeletal wreck make it both alluring and bone-chillingly spooky at the same time. Between its adolescence cruising between Sydney and New Zealand and its final destination in the heart of a cycline, this first-of-its-kind triple screw steamer made headways as a floating hospital during World War I then was later sold to a Japanese company. Take a plunge into the deep blue to see time stand still as this perfectly intact military bomber makes a grand splash on the white sugary seabed. Immersed in over 140 feet of water, the Black Jack, also known as “Flying Fortress” is well protected by schools of barracuda, reef sharks, hammer heads and manta rays that hover over the ship’s coral-decorated cockpit, caliber guns and turret guns. With more time spent below the ocean then above, you will be amazed by the unforgettable views as you descend deeper into Black Jack’s history and unparalleled underwater glory. Before falling into the ocean in 1930 and splitting into two, the Northern Light or “Elbow Wreck” was one of the most technologically advanced steel hull ships in her prime. However, the vessel faced many challenges, including being set on fire by her own owners for insurance money. Although their plan was unsuccessful, the ship emerged triumphantly until she was carried into a storm, and ultimately to a watery grave. The diving areas of the Northern Light still continues to be flooded with curious divers, all intrigued by her rare beauty which shine brightly amid the clear blue depths of the Elbow Reef. Sitting at the bottom of the Indian Ocean, HMS Hermes is a profound treasure and a priceless jewel worthy of discovery. The vessel was a first purpose British aircraft carrier which joined the league of many other ships that were torpedoed by Japanese attackers. Now the ship lies about 145 feet deep and her port, barrels, bow, and turret guns, in addition to other parts, remain open for constant view by suspicious divers. As one of the more seldomly visited shipwrecks, many species of feeder fish and coral have made her their home, illuminating HMS Hermes with their brilliant colors. As the Caribbean’s largest shipwreck, there is plenty to see below the surface. Built in March of 1939, this monolithic vessel served as a German freighter before her crew members lit the ship on fire to prevent Dutch marines from seizing her. At roughly 400 feet, this unforgettable ship piques an interest amongst divers who can be seen intermingling with lobsters, shrimp and exotic fish as they courageously glide through the ship’s portholes, deck and interior still noticeably boasting their original physique. If you don’t believe in karma, you will after descending into the eventful past that ultimately led to Shinkoku’s epic sinking. Built in 1941 as a ship intended for the Japanese navy, the freighter played a major role in the Pearl Harbor attack as a supporting ship. Just three years after this colossal incident in American history, the ship was laid to rest on the ocean floor during the infamous Operation Hailstone after she was shot on the aft starboard area of her side by American torpedo bombers. Well-lit by the adorning coral formations which cover her entire body, this 500-foot jewel of the sea a particularly stunning dive site at night. A warrior in her own merit, the Greenpeace flagship was expected to set sail to the Moruroa Atoll to put a stop to nuclear testing of the French. However, unbeknownst to the crew, the French had other plans and rocked the core of the Rainbow Warrior by bombing her while she was docked in Auckland, New Zealand one unforgettable night. Taking a plunge to the ship, you will be greeted by dolphins, fish and manta rays guarding her coral-filled frame. Just look out for sharks.